HOLLYWOOD, CA -- An overly excited fan caused an incident on a Hollywood street on Friday when she insisted that a passerby was late night talk show host Jimmy Kimmel. The passerby, Bobby Willoughby, 37, happens to resemble the famous comedian but didn't comprehend how to respond to the attention due to a lifelong affliction with Down Syndrome. 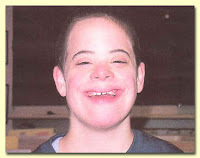 Although Mr. Willoughby reportedly has a mild case of the syndrome, which is characterized by specific facial features and an array of physical and mental cognitive disabilities, apparently the rapid escalation of movement and shouting from the fan, 23-year-old Heather Johnson, caused him run out into rush-hour traffic on busy Hollywood Blvd. in this famous neighborhood o f Los Angeles. Fortunately, Willoughby was only clipped by a slow-moving moving truck and Ms. Johnson, a trained EMT, was able to provide assistance. Mr. Willougby is expected to make a full recovery. Spokespersons for both Jimmy Kimmel Live and the ABC network declined to comment on the incident.